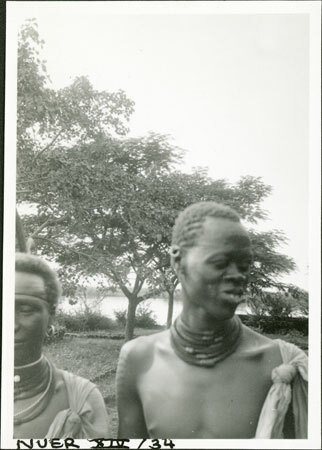 A head-and-shoulders portrait of a man (identified as Wia), with another man standing beside him partly out of frame. The location seems to be Nasir on the Sobat River, which is visible beyond. Wia was previously photographed by Evans-Pritchard during his earlier phase of fieldwork in 1931 at his father Cam's village of Yakwach on the Sobat River. This photograph seems to have been taken in 1935 at Nasir on meeting him again. Evans-Pritchard notes that on re-engaging Wia in 1935 he had collected a small herd of cattle at the district headquarters there, as a result of working for Corfield the district commissioner as his groom. Note on print reverse ms pencil - "28 5 A211" & print front border ms ink - "NUER XIV/34"
Morton, Chris. "Nuer men on wall" Southern Sudan Project (in development). 03 Jan. 2006. Pitt Rivers Museum. <http://southernsudan.prm.ox.ac.uk/details/1998.355.667.2/>.